A helpful guide to understand the BBCOR certification stamp. In the past, the National Federation of State High School Associations and the National Collegiate Athletic Association used a longstanding bat certification test called BESR, which stands for Ball Exit Speed Ratio -- and this test basically measured how fast a ball bounced off a composite or aluminum bat barrel. What the BESR test failed to account for was how a bat would perform after it was broken-in - safety soon became an issue because the bats were simply getting too hot. So, in response to this growing problem, the NFHS and the NCAA implemented the new BBCOR certification test, which is an acronym for Batted Ball Coefficient of Restitution. Confusing, huh? 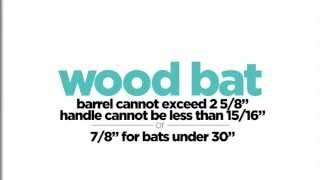 Well, just know that it basically ensures that all non-wood bats -- so your composite and aluminum bats -- perform similar to wood, even after they’re broken-in. 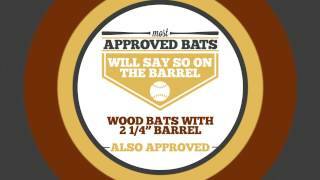 Once the bat passes the test, it’s deemed BBCOR certified and stamped. 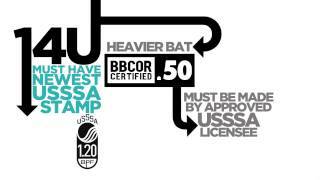 If your bat doesn’t have a BBCOR certification stamp, you won’t be able to use it in a game at the high school or collegiate level - that’s how important it is. Alright, that’s all I have for you today. 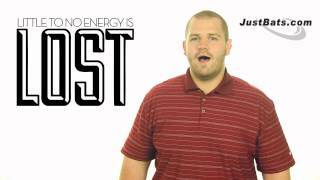 If you have any additional questions, don’t hesitate to call our super friendly customer service reps or if you’re ready to browse for a new BBCOR bat, check out JustBats.com for the largest selection of BBCOR certified bats on the web and remember, from click to hit.